A key technology frontier for the shale gas industry will be found in an unlikely place -- 10,000 feet down at the bottom of the sea -- according to a leading global equipment supplier to the drilling industry. Johan Pfeiffer, vice president of surface technologies of Houston-based FMC Technologies, says the tough, compact equipment required to handle remote deep sea-bottom operations will become increasingly important to shale gas drillers. "We believe we're going from an industry that is very fragmented, involving smaller players and not a lot of technology, to an industry where technology is going to be introduced," Pfeiffer told a Utica Shale conference last month in Youngstown, Ohio. It is a strategic concept that remains to be proven, said Tad Patzek, chairman of the Department of Petroleum and Geosystems Engineering at the University of Texas, Austin. Patzek was not at the Ohio conference and did not hear Pfeiffer's presentation, so he said he is withholding judgment on the specifics of the strategy. But Patzek said he is skeptical in principle about the economics of transferring subsea processes to shale production on land. A subsea separation station for oil and water has applications in shale drilling, FMC Technologies leaders say. Image courtesy of FMC Technologies. "What makes absolute sense in the expensive offshore environment, where a single well will run you between $100 million and $200 million, doesn't make sense when you want to shave every cent from your well so that it costs $6 million to $8 million," Patzek said in an interview. Pfeiffer made the pitch for a group of technologies developed by his company for drillers in the North Sea, off the coasts of Brazil and western Africa, and in the Gulf of Mexico, as operations there continue to recover from the 2010 Macondo deep-sea oil spill. They include tall "tree" structures of pumps and valves installed above wells to control high-pressure injections and separation systems that treat flow-back fluids from wells. 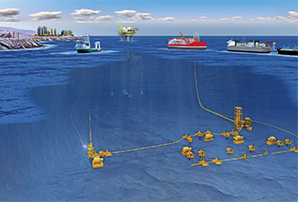 Typical seafloor installations include clusters of wells, processing and pumping installations. One application is a "de-sander" unit that separates the corrosive sand content from flowback liquids by spinning the mixtures at a very high speed. This has an obvious and valuable application for shale gas operators who must recover as much as a million gallons or more from the fracking fluid mix forced into the shale wells, Pfeiffer said. "The problem we have today [in shale sites] is with very, very high returns of proppant and sands from the well, you are basically eating up equipment downstream. The one thing the operators don't want to have once they've completed their wells is a big repair bill," Pfeiffer said. "If you can separate out the sand in the proppant early in the return phase, you dramatically improve the life of the equipment that is downstream," he said. Pfeiffer said the extreme requirements for deep-sea drilling equipment have a connection to shale gas operations that may not be obvious. "If you are going to put something at the bottom of the ocean, it's going to stay down there for 25 years, and you're going to have very limited access to it," he said. It must be compact and robust. Shale operations have the same requirements, he said. "The pads are very crowded and the pads are going to become more and more complex with more and more wells and more and more equipment," he said, as operators try to control costs by running multiple wells from a single platform. Drilling trees and other units are used over and over and so must hold up, he added. "When you are moving equipment from pad to pad, you can't have it falling apart. "We have spent hundreds of millions of dollars developing this technology," said Pfeiffer, whose company, one of the industry's largest, reported a $6.7 billion order backlog this summer. "Let's try to apply it" to shale, he said. Directional drilling bits are an example of a technology that has been crucial to both subsea and shale development. In shale plays, directional drilling is required as the drilling path moves from vertical to horizontal to penetrate the shale rock formation. In one common technique, drillers employ steerable drilling heads with motors that turn the drill bit's cutting face in a desired direction by pumping mud through the motor. Drilling must be paused when the bit's direction is changed. Newer methods use flexible drill bits whose direction is controlled by pressure pads that turn with the bit so drilling can continue as the bit changes course. This process cuts drilling time dramatically and lessens the risks of drill bits becoming stuck, equipment producers say. "It's a great technology, and yes, it should be used in shale wells. But in practice, for cost reasons, it won't be applied widely because it's too costly," Patzek said, speaking of the advanced steerable drilling systems. "You can see how in the long run, if you did it correctly and you actually followed the formation and fractured into your formation, it would probably make a better well than otherwise," he said. "But in the short term, the way you make decisions in drilling, you are not going to think about this." In his presentation, Pfeiffer said the cost issues have to be effectively answered. "When we talk to our customers, we say, 'We understand your challenge on costs. We understand that you need to be able to develop wells with very attractive economics,'" he said. One of FMC Technologies' target markets is the handling of the high volumes of water used in fracturing. The company's strategy anticipates that, in time, shale gas developers will have to recycle most of the drilling fluids using automated closed processing systems -- the kind it places at ocean floors for deep-sea operations. But these systems will have to pay for themselves, he said. "Recycling more water reduces the logistic challenge of moving water back and forth to the well site," he said. "The price on the pad may be slightly higher, but the overall cost for the operator goes down. ... The total has to be a cost decrease, not a cost increase. You're just switching costs around." On water treatment, "the soft spot, we believe, is to be able to treat water for under $2 a barrel," Pfeiffer said. "Today, you can source water maybe for under that, but in some areas, the ... disposal can go up to $10. If you can treat water for under $2 [a barrel], we believe this will be a widely accepted technology. "Water is clearly a challenge. We need as an industry to move to an area where we are going to be 100 percent recycled water. That has to be our goal. In some areas of the Marcellus, that is already the case. But in other areas of the country, it's not at all the case. We believe that this industry, if we don't address the water issue, we will eventually lose." Rules are likely to be a more powerful driver for change than industry-adopted best practices, he suggested. "The only time an operator would accept higher cost if it is due to regulation," Pfeiffer said, and that, too, is an expectation built into its long-term strategy. "One area where we believe regulation will become more stringent is in reducing gas released into the atmosphere and flaring," he said. "There is still flaring going on. We believe that we are going to move to an area of green completions, which basically says no gases will be released to the atmosphere. "All the gas will be reused in sales pipeline and brought to market," he said.